Searching for the perfect dust collection system can be difficult. CFM, MERV Rating, Decibels, Curve Graphs can make your decision very confusing. 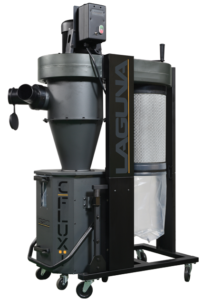 Consider below a crash course on dust collection and view the proof why Laguna makes the best Clean Air Systems on the planet. 3. What is CFM & how is it calculated? 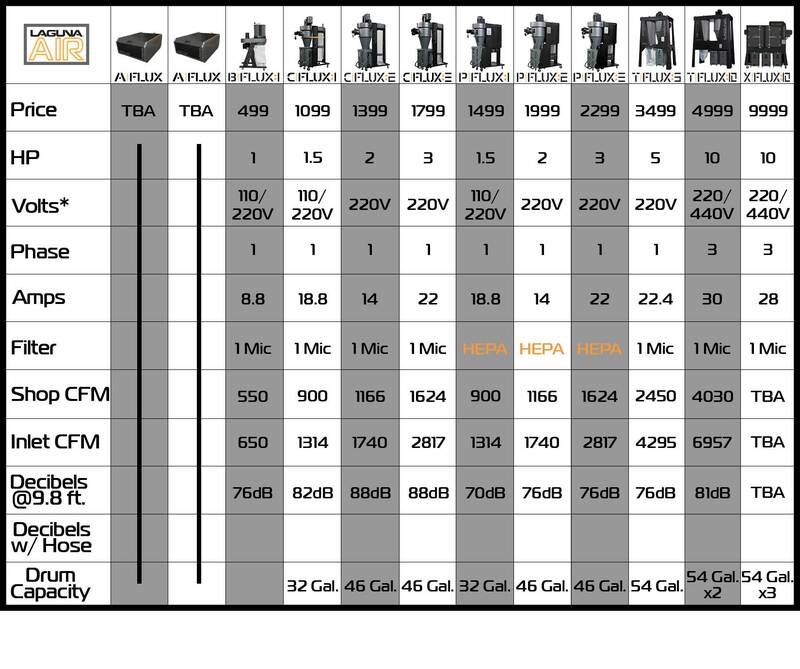 The c|flux:1 comes standard with a 1 micron canister providing filtration of 99.7% of particles 1 micron or larger . • Empty and reload your system with ease. • No more fumbling with locks and clasps. What is CFM? How is it measured? CFM or Cubic Feet per Minute is a broad measurement used to calculate how much air can be moved in a given time. This measurement is usually taken with the assistance of a vane air velocity meter or vane anemometer. For the purpose of vacuums, the CFM also communicates the strength of suction on a machine. Thus, a 1200 CFM cyclone dust collector will be more effective than an 800 CFM machine. Picking the right dust collector based on CFM can be tricky since it’s a general measurement. Adding extra length or width to the duct of your dust collector will decrease the CFM, consequently affecting its performance. At first glance it’s logical to think that since one dust collector has a CFM of 1400, it is the better choice over another that is 1000. However, that 1400 CFM dust collector may have been measured without any attachments (duct, nozzle, etc) at the port of the machine. After all is said and done, the actual CFM of the collector after setup could be only 700 CFM, HALF of what you thought it was originally! Thus, due to the relative nature of the CFM measurement it is best to trust companies that are transparent with how they arrive at their CFM measurements. The necessary feet per minute (FPM) to move heavy sawdust is 4000 FPM from a dust collection machine. Since CFM = FPM x Area, hobbyist sized stationary machines require an average of 350 – 450 CFM for sufficient dust collection. Professional machines are harder to be averaged out in a similar way due to the variance in scale from small businesses to corporate sized manufacturing plants. Here at Laguna Tools we take our measurements based on applicable dust collection scenarios. Instead of measuring at the port of the machine, we take our measurements in the front half of a 12.5-foot testing hose. While this is a bigger size than the standard 10-foot tube, it helps provide a more accurate measurement of the actual CFM. We also test it with different air inlet sizes to arrive at an even more precise measurement for buyer convenience. 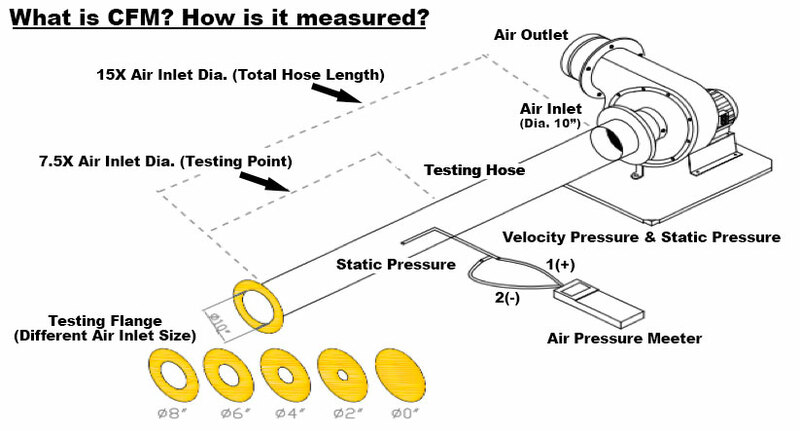 The diagram below illustrates where we place the air pressure meter and how it is set up. MERV stands for Minimum Efficiency Reporting Value. 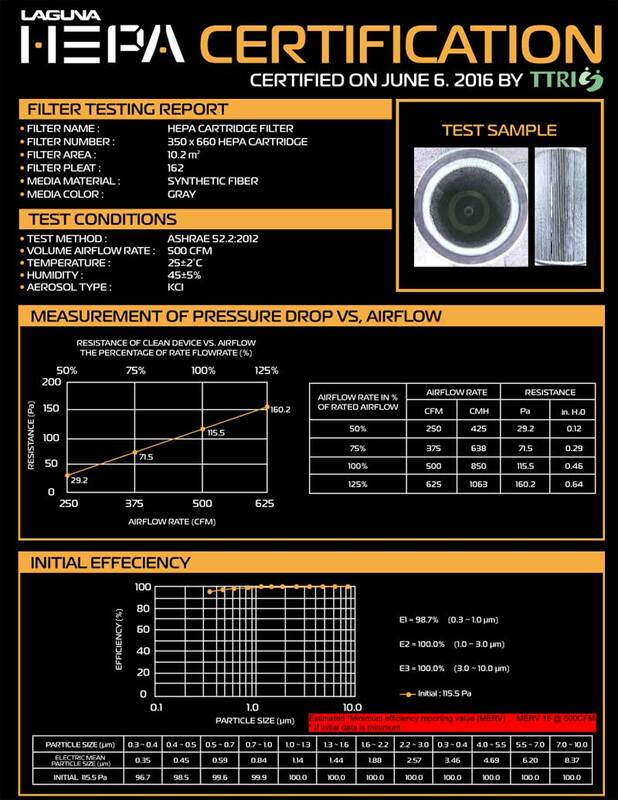 Or in English, “how effective is your air filter?” MERV ratings range from 1-16. The higher the MERV rating on a filter, the fewer dust particles and other contaminants can pass through it. The American Society of Heating, Refrigerating and Air-Conditioning Engineers (ASHRAE) designed the MERV scale to represent a filter’s worst possible performance at removing particles .3 to 10 microns in size. The decibel (abbreviated dB) is the unit used to measure the intensity of a sound. The decibel scale is a little odd because the human ear is incredibly sensitive. Your ears can hear everything from your fingertip brushing lightly over your skin to a loud jet engine. In terms of power, the sound of the jet engine is about 1,000,000,000,000 times more powerful than the smallest audible sound. 1st. A Reading is done at a distance of 9.8′ from the inlet at 60” above the floor. 2nd. A Reading is done at a distance of 9.8′ from the opposite side of the inlet at 60” above the floor. The average of the readings give us the dB rating.